Elliott can be heard regularly on WQXR, Classical 105.9FM in New York and on www.WQXR.org. 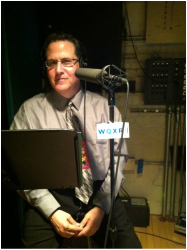 Part of his duties include directing and producing the annual radio drama reading of A CHRISTMAS CAROL for both WNYC and WQXR. In 2010 David Hyde Pierce played Scrooge and in 2011 Oscar winner F. Murray Abraham took the lead. 2012 - Brian Cox. 2013 - Tony Roberts. All the other roles are played by WQXR and WNYC radio hosts. Fred Newman (Prairie Home Companion) does the live sound effects and composer and pianist John Forster provides the music.